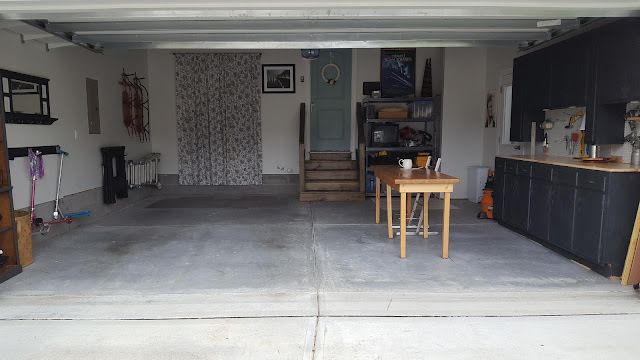 Our garage is starting to look more finished these days. 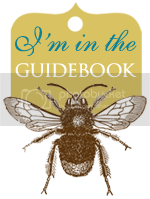 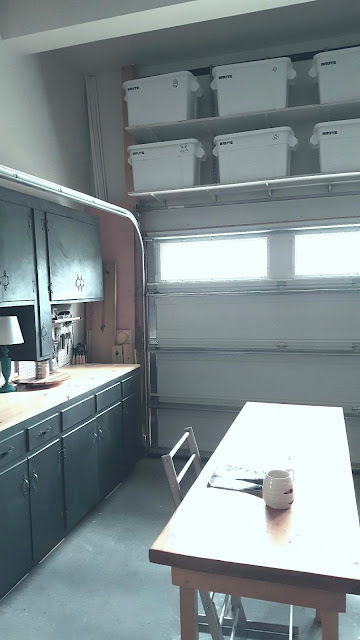 And unfortunately my digital SLR camera is broken so I had to take pictures with my phone instead and use Blogger on my phone which doesn't allow me to write content next to the photos. 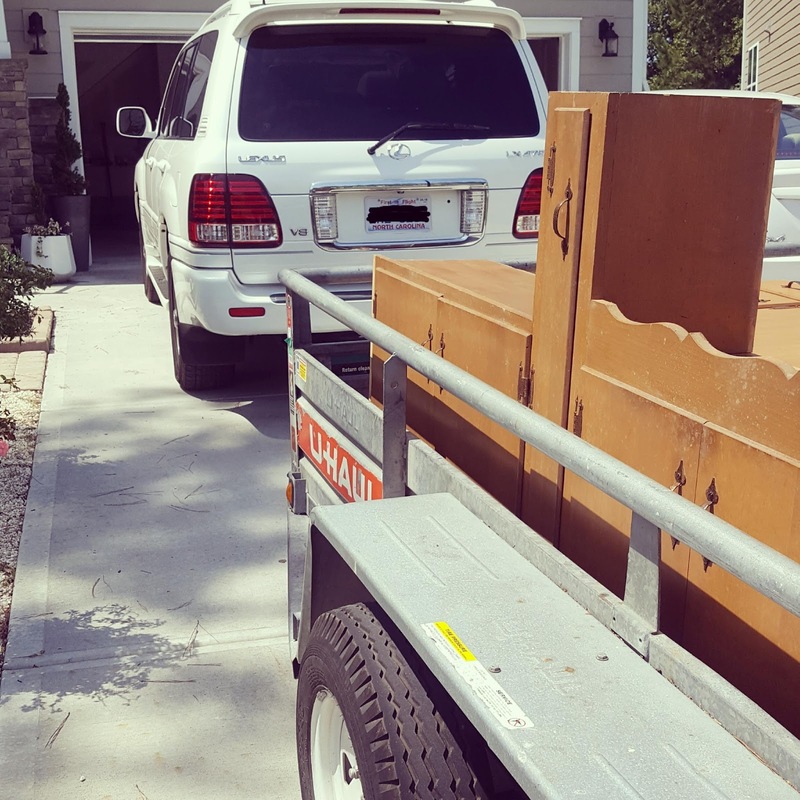 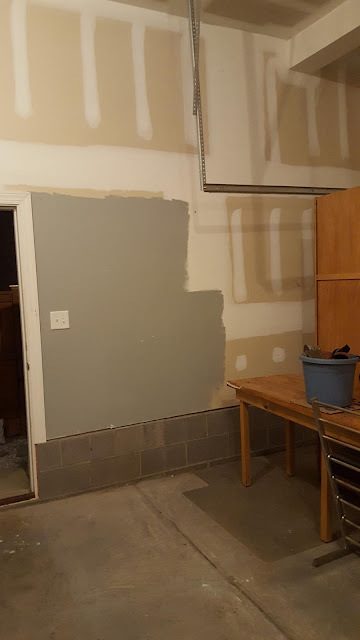 So you'll see the After photos first and the Before photos last. 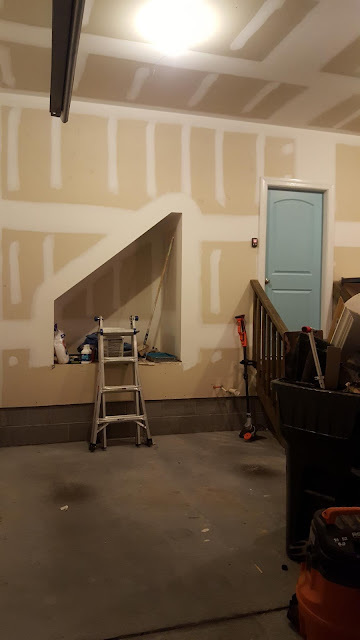 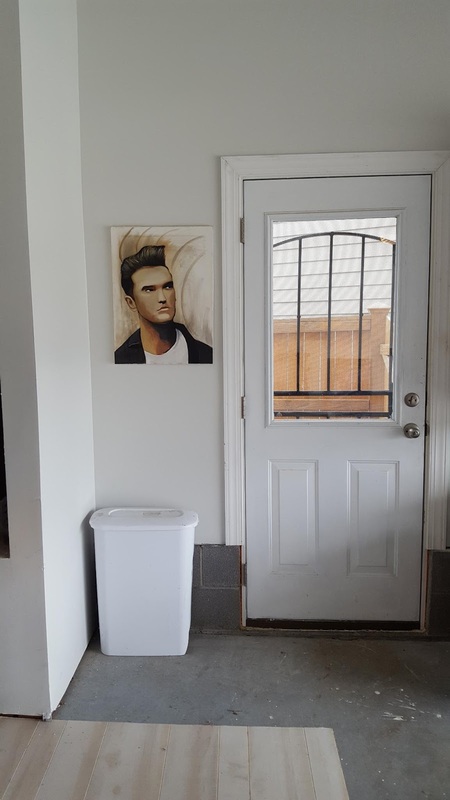 We still need a refrigerator that will go where the small white trash can is and a utility sink that will go to the left of the stair case. 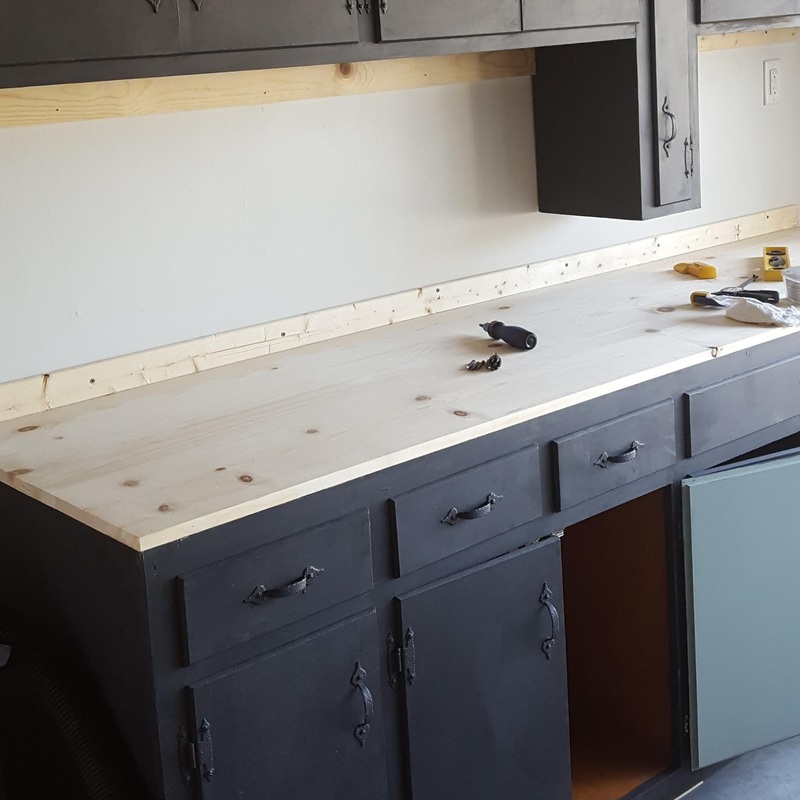 It's currently plumbed but we need to find a nice sink. Also we may want to add a stain to the floor as well. 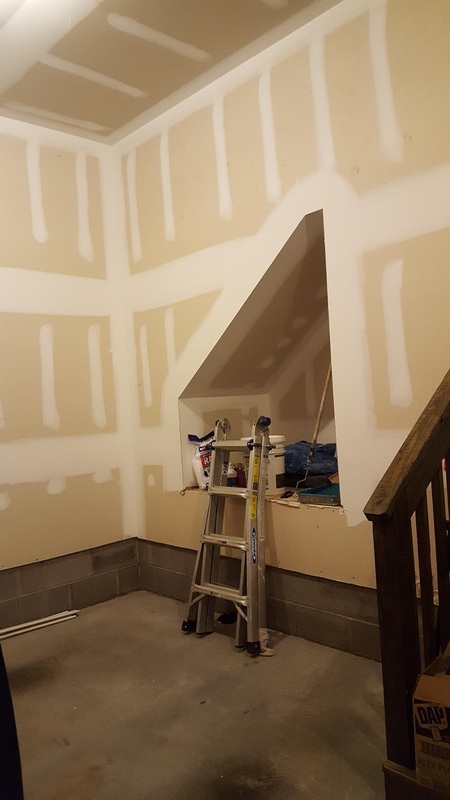 But we know this will be a huge undertaking. 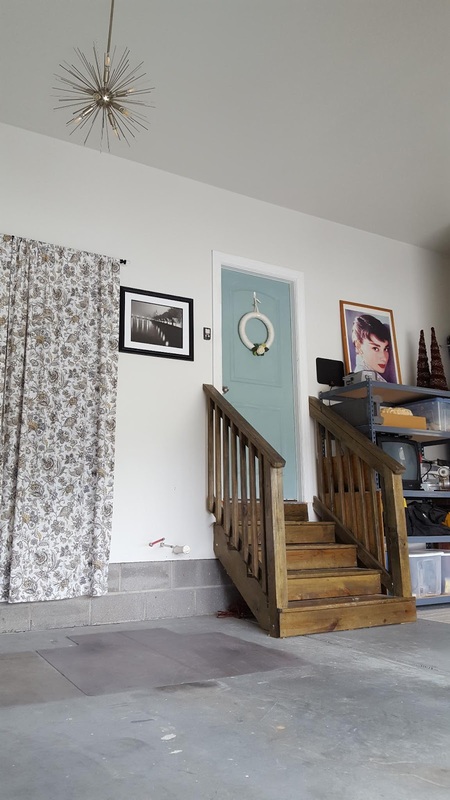 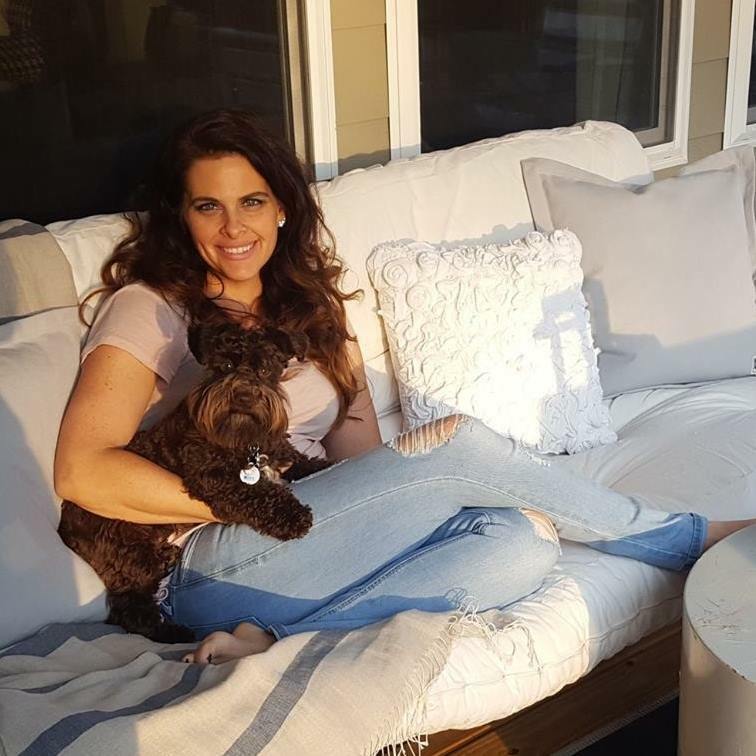 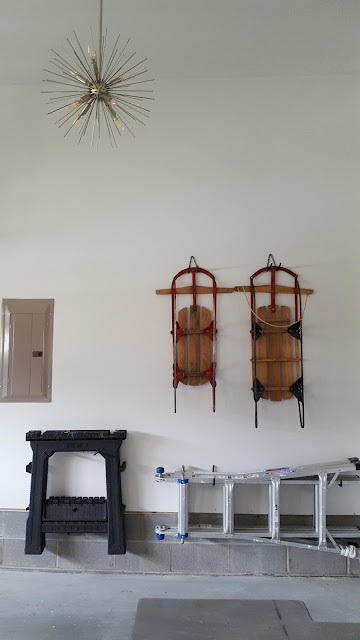 The walls and ceilings were primed and painted with 50% Benjamin Moore's Gray Owl. 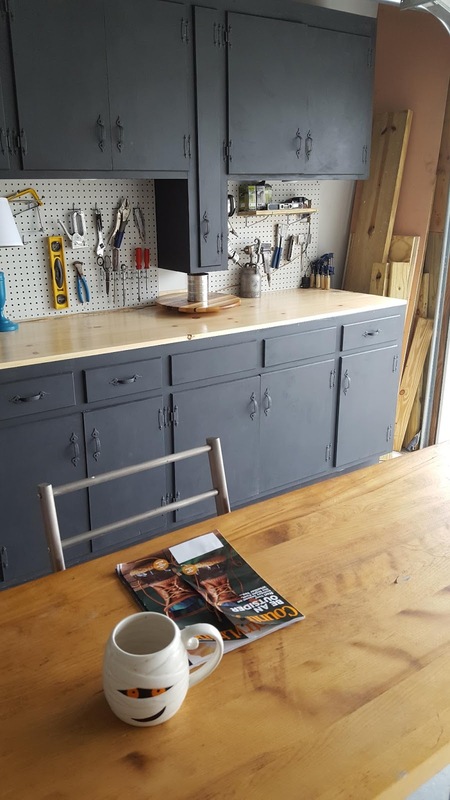 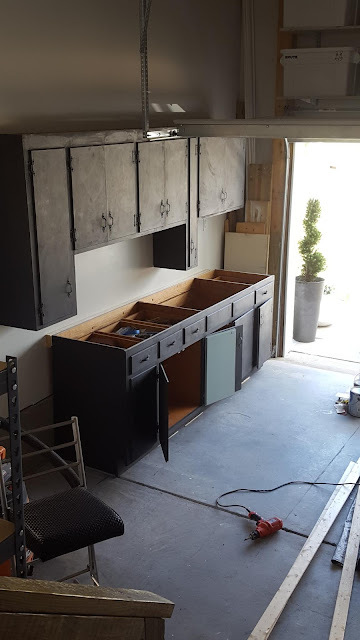 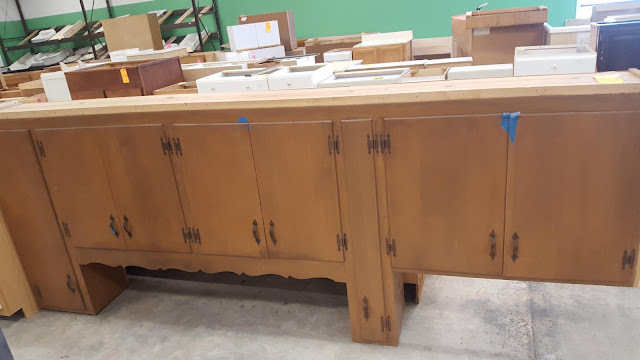 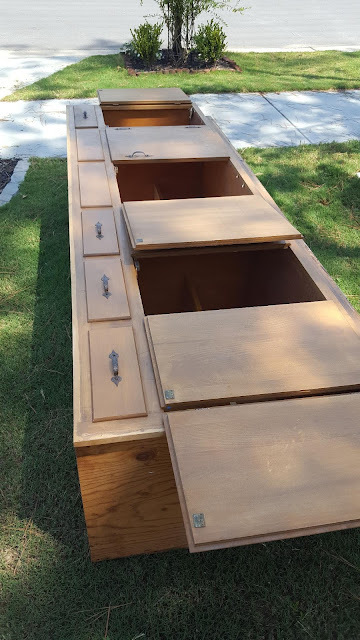 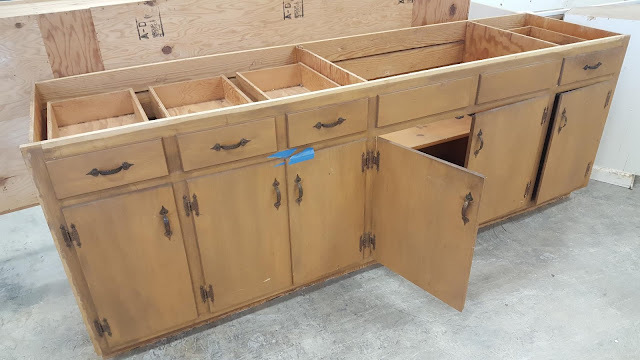 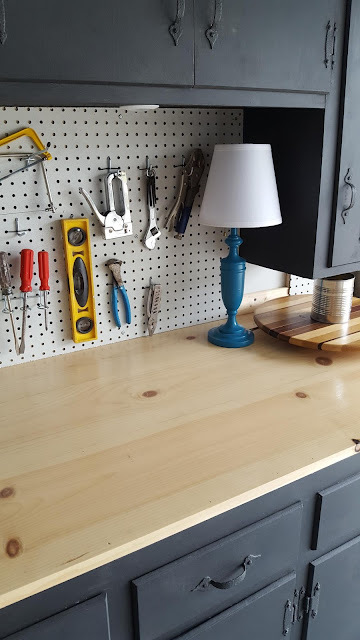 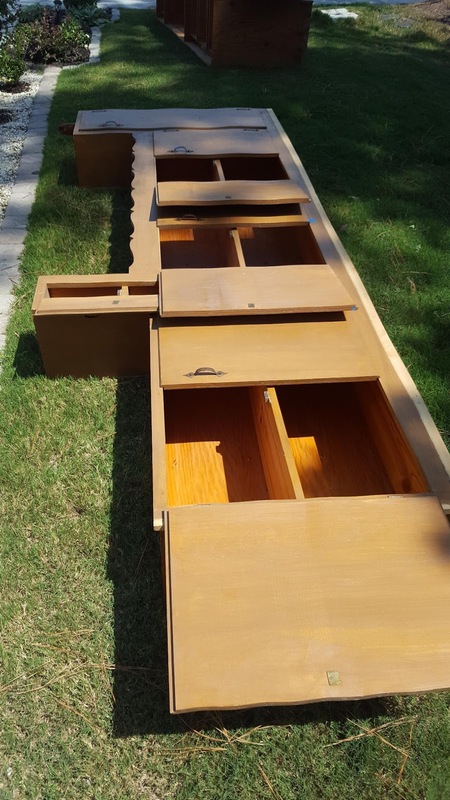 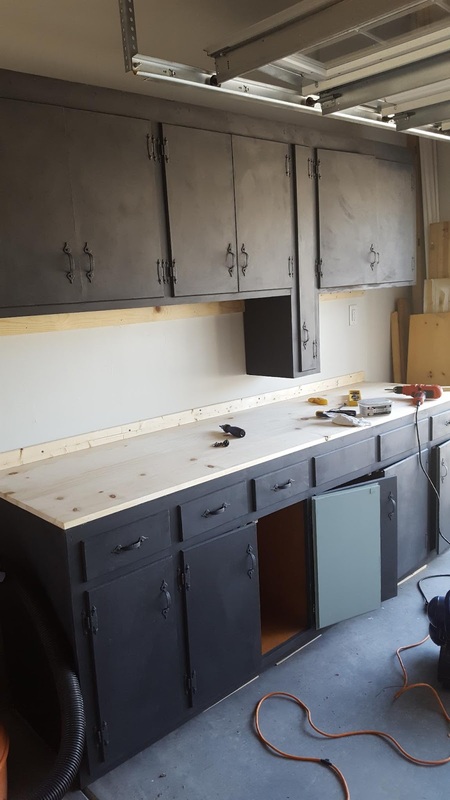 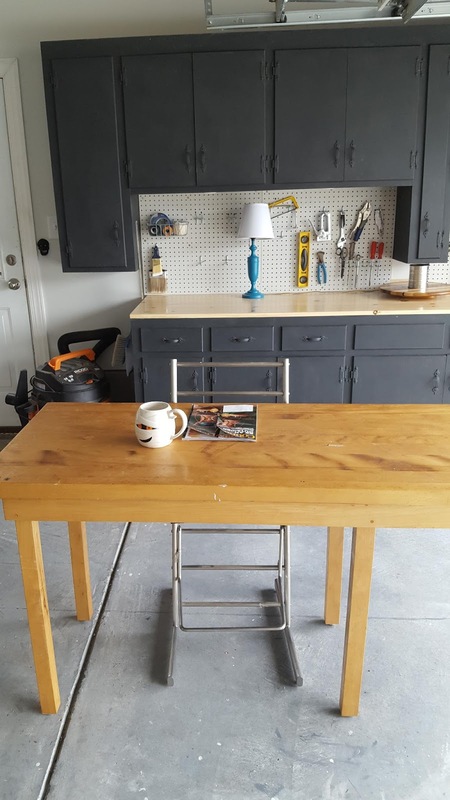 The cabinets were found at the Habitat Restore and were cleaned, sanded, primed and painted with Annie Sloan's Graphite and the inside doors were painted with Annie Sloan's Duck Egg. The bookcase is also from the Habitat Restore and painted Graphite as well. 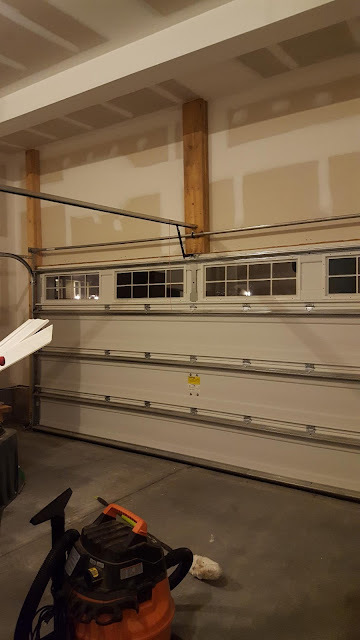 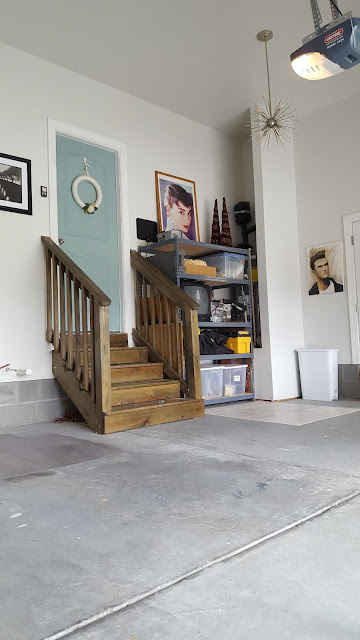 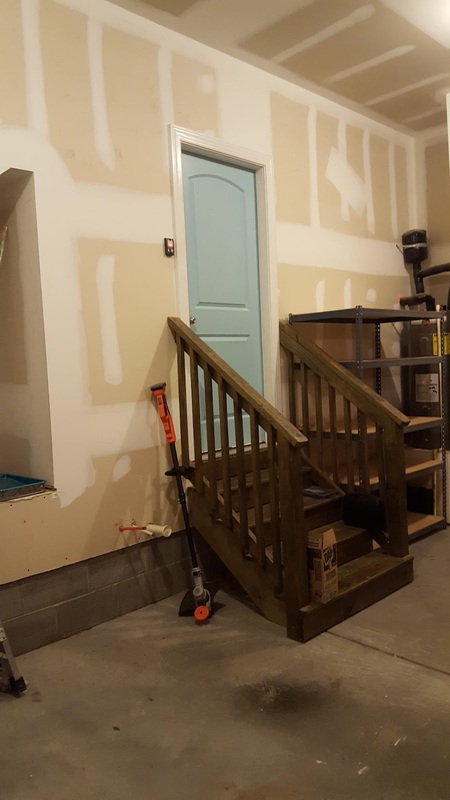 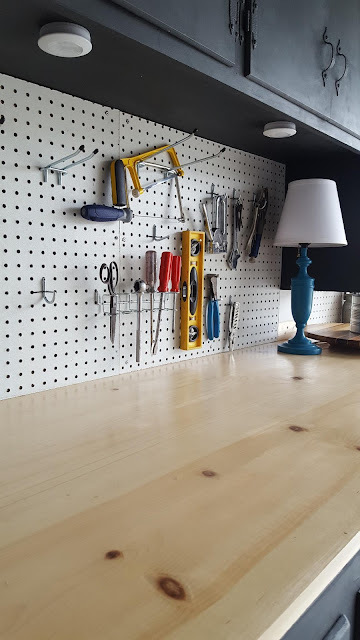 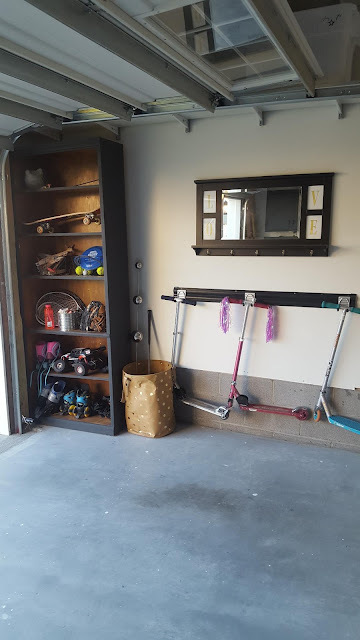 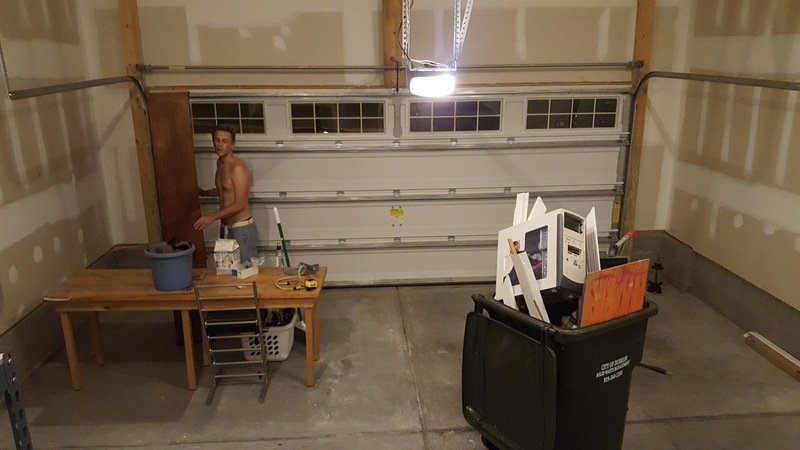 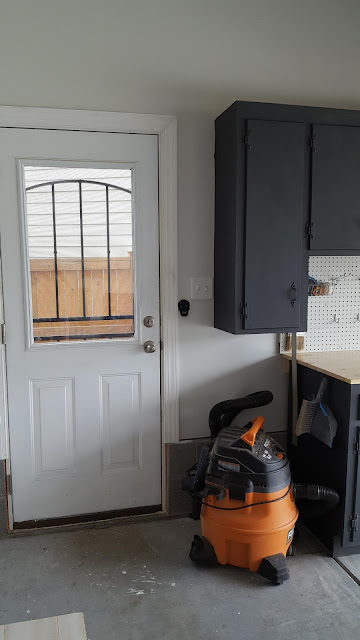 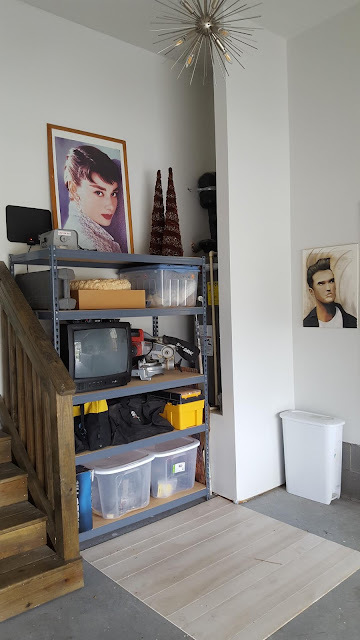 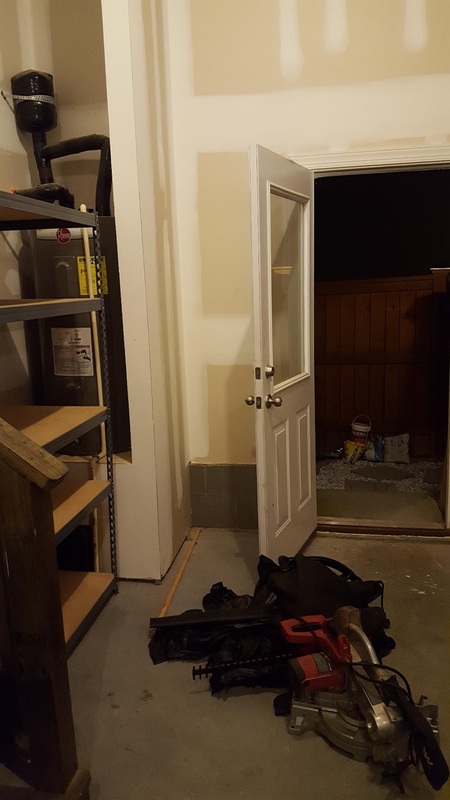 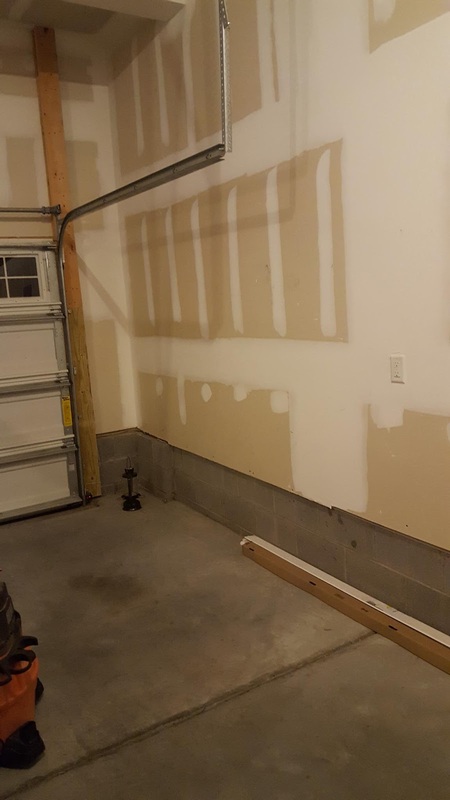 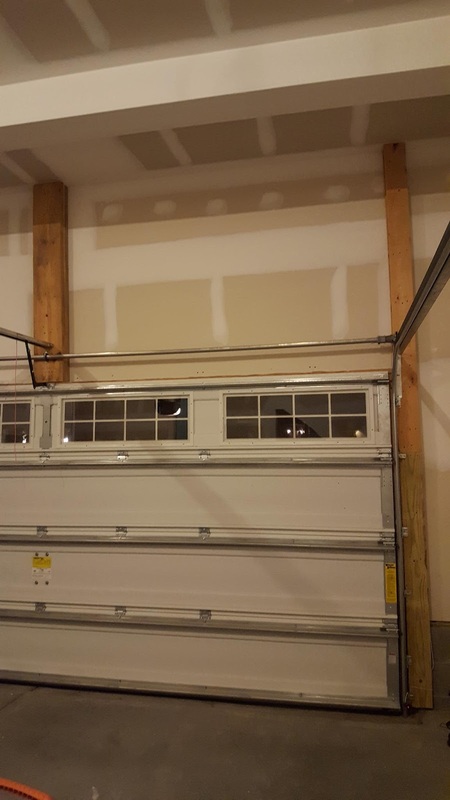 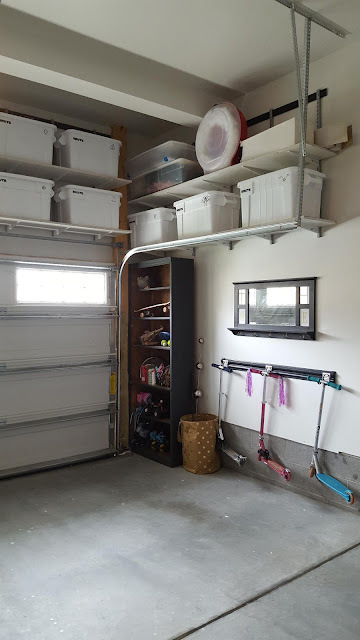 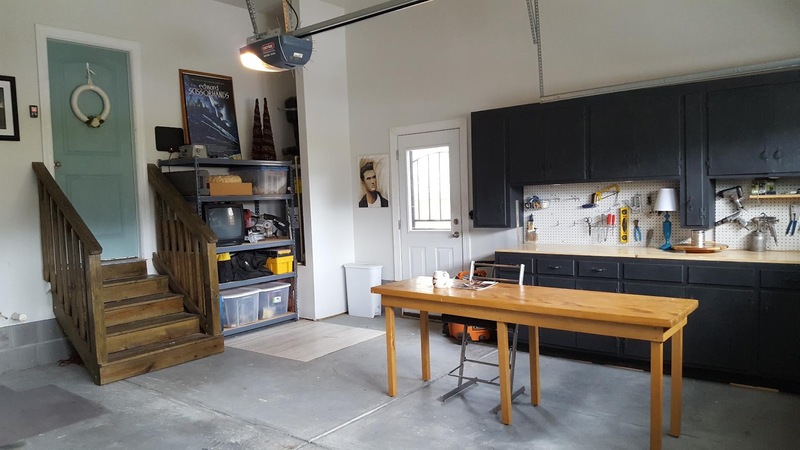 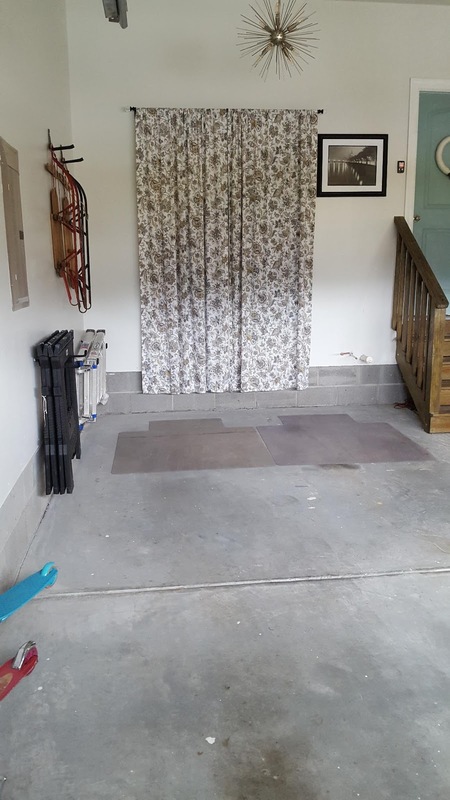 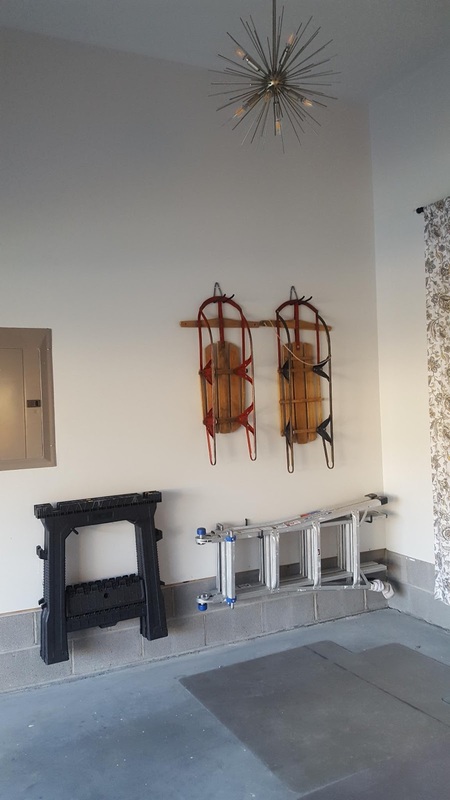 Joe installed the shelving system above the garage door using wood painted white and a track system with metal brackets from Lowe's. 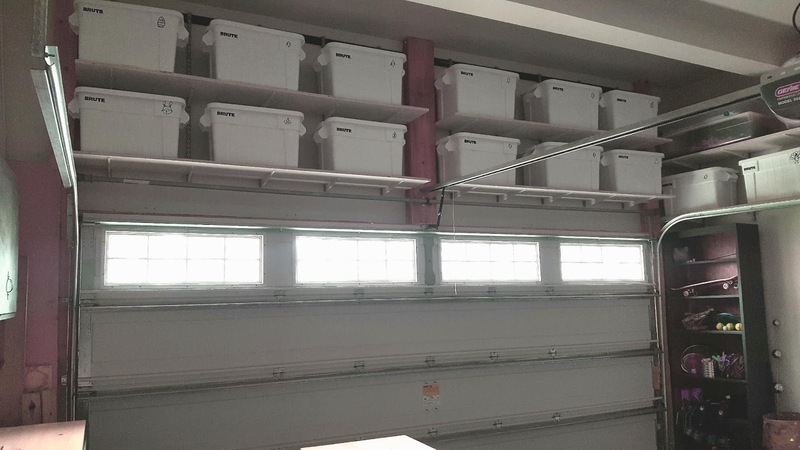 All of the white storage bins are Brute white 20 gallon bins. 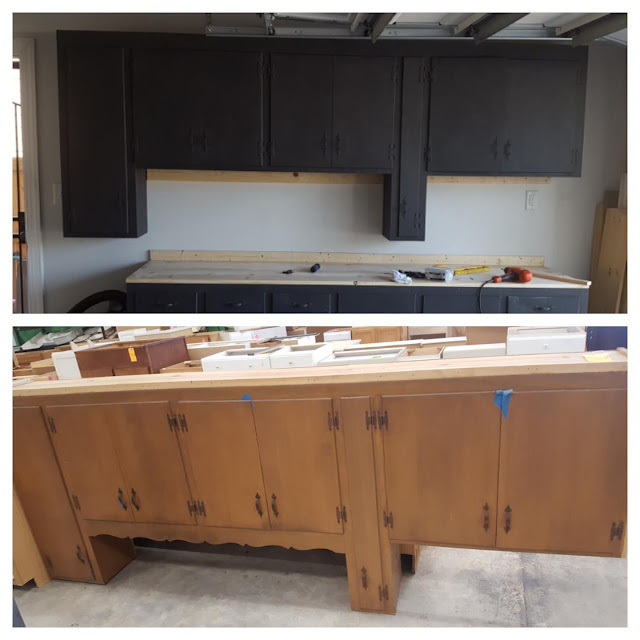 The countertop was made from pine and stained and sealed in a natural wood stain. 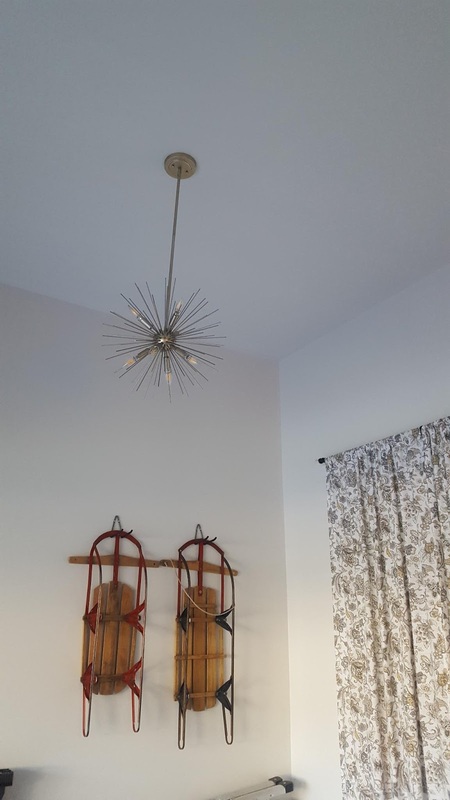 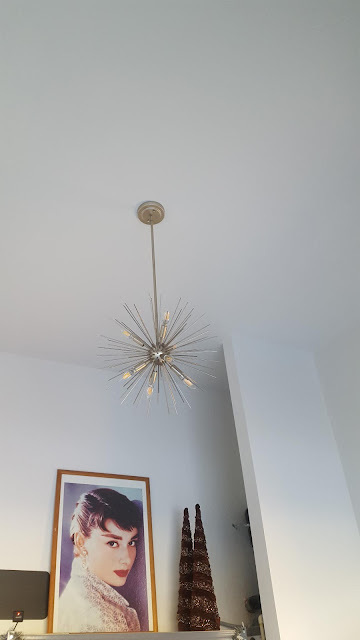 The sputnik light fixtures are from Joss and Main. 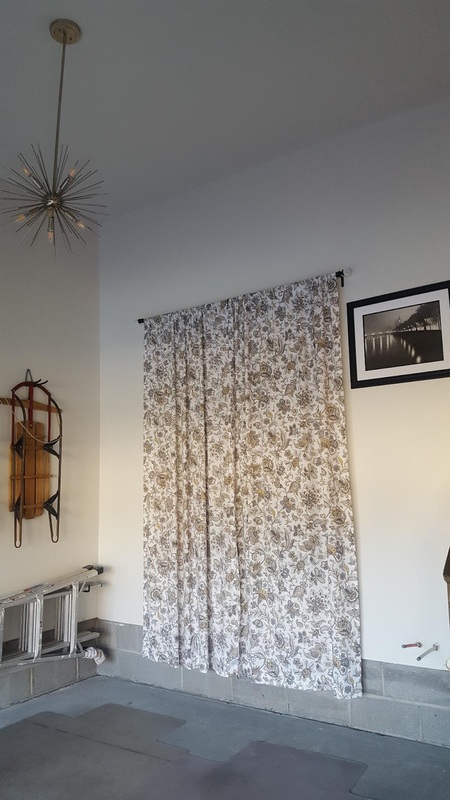 We hung curtains over the storage area where we store all of our camping gear. Out in the backyard Joe built a cute gray metal storage shed for all of our lawn equipment. 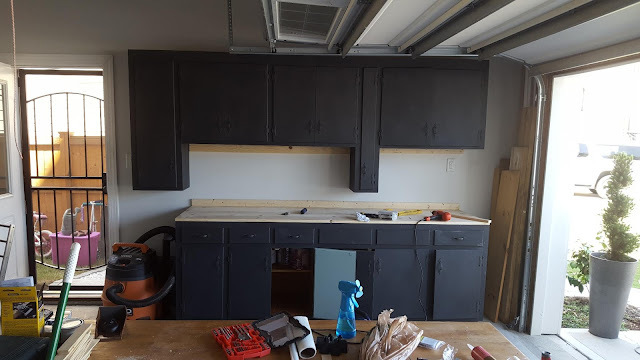 Lots of work . 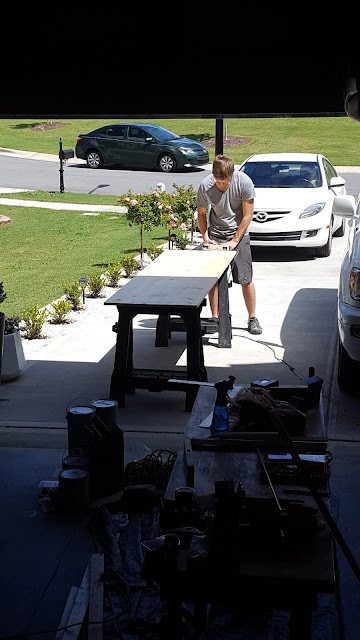 You did good !